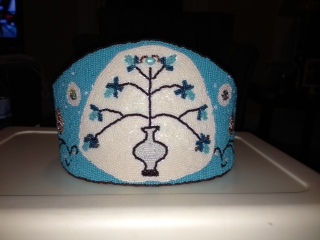 I beadstitched a headpiece to match my new regalia. While I have used lazy stitch in the past to bead (barrettes mainly), I’ve never used that stitch for something this big. 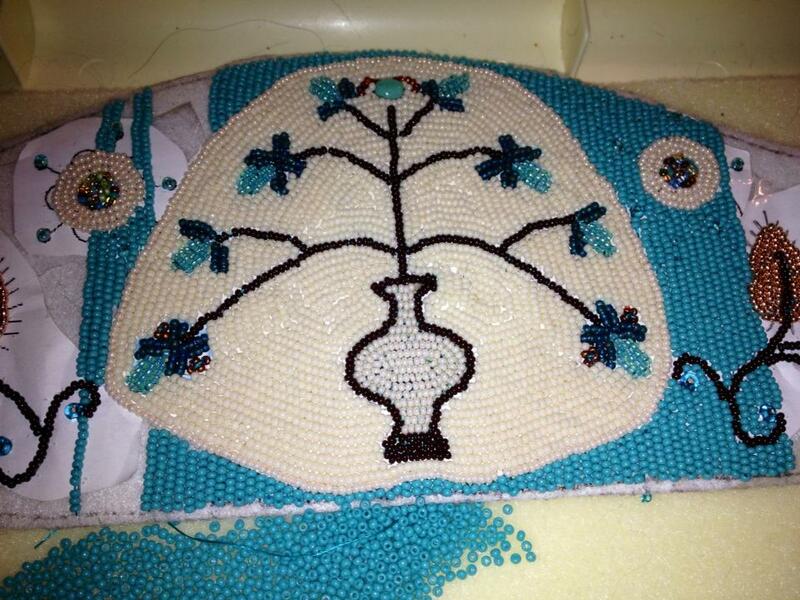 I had a bit of trouble along the way – not enough beads in the colors I started with for one. Two – I didn’t have the technique down pat, And, three, it took forever (in my mind). A couple of years ago, I bought some beautiful cream and chocolate beads from a bead store in Salem, MA. I didn’t have a project in mind when I purchased them but they were so pretty and perfectly matched to each other that I had to have them. And of course, I had to use them for this project. 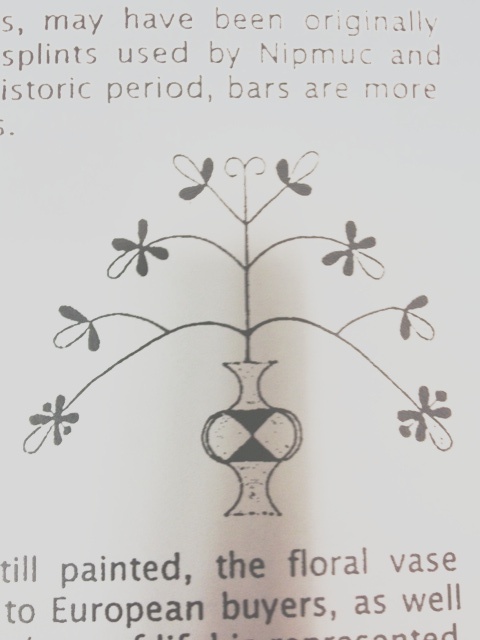 One of my favorite patterns is the vase pattern from my ancestors’ Nipmuc wood splint baskets. I decided to use this design in my headpiece (also called a crown but I don’t really like that name.) 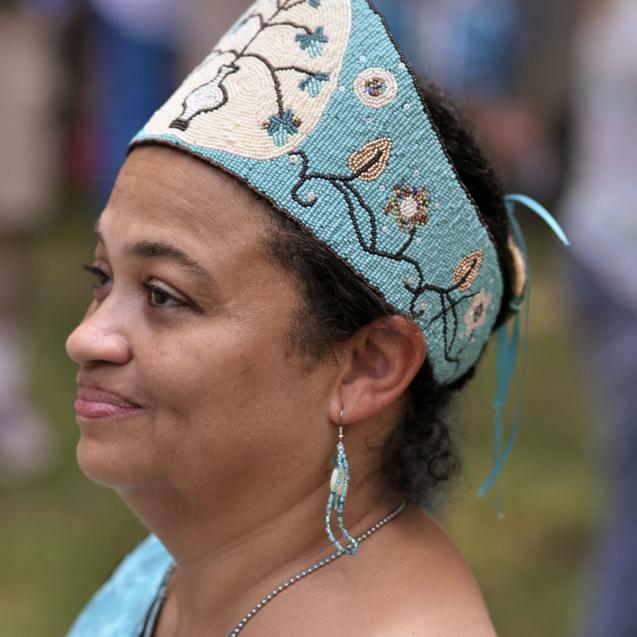 I chose the colors of my regalia from a bead soup mix at Bead Fiesta in Sterling, MA. The bead soup combined turquoise, chocolate brown, cream, and copper. The combination called my name so I naturally bought cloth to match. I started with the cream and chocolate beads but quickly ran out of the cream. I called the bead store in Salem but they didn’t sell those beads anymore. 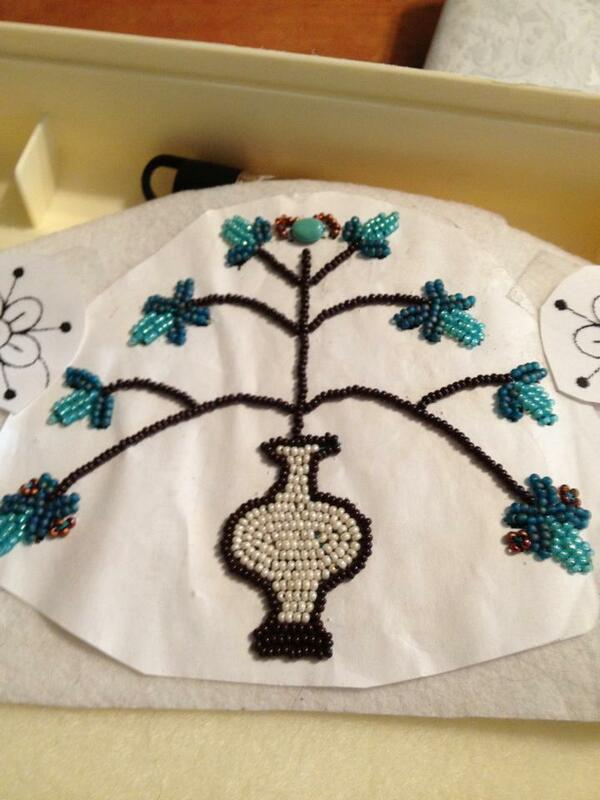 I really wanted to fill in the circle around the vase with those luscious cream beads. I tried every store -bead and craft- but no one had the exact bead. So I substituted with a close color. 1. Always make sure you have enough beads to complete a project. 2. Make sure you practiced a technique enough times to make a quality object. I was very disappointed in the way my headpiece turned out. I felt sure that people would point out the flaws at the pauwau. Of course, no one did!! Anyway, I think it will be awhile before I tackle another headpiece like this. Meanwhile I’ll keep practicing on barrettes and medallions. Are you familiar with the family Susie Arkless and Sandy Morris if so I understand they where Native American do you know anything about them? Susie was born in Mendon Mass and Sandy was born New Orleans LA. Yes, we do know about Susie and her husband, Sandy. Their descendants are part of the tribe. How do you know if they are part of the this tribe, by tribe do mean Nipmuc I’ve been trying to find out more on my grate grandmother side of the family so I was wondering how you came across that info . Can you direct me to more info I would really appreciate. By the way are you related to Toney that married to Martha (Booker)Toney? They both live in NV. Where also related to the late Harry C Morris and Elise (Charity) Morris? It’s Susie Idella Arkless that’s the Nipmuc. Thank you very much I didn’t know that. You see Sandy and Susie were my great grandparents. They had at least there children Harry C, Susie I, Joseph. Harry C Morris married Elise (Charity) Morris she was from VA. Harry C and Elise had several children: Beatrice, Annie, Olga, Shirley, Sandy, Jane, Clinton. My mother was one of the sisters (Beatrice). By the way there are two of the remaining family members left. Jane and Clinton Morris. They live in Seabury Heights off Belmont St in Worcester. Do you have any pictures of Sandy and Susie? So I contacted one of your cousins. Lots of Nipmucs have lived in Seabury Heights. Jane and Clinton live in apartment 244 Belmont St Apt 408 Worcester, MA there bell buzzer will be listed as J C Morris. Do you know who Susie fathers name as well as her mother name?